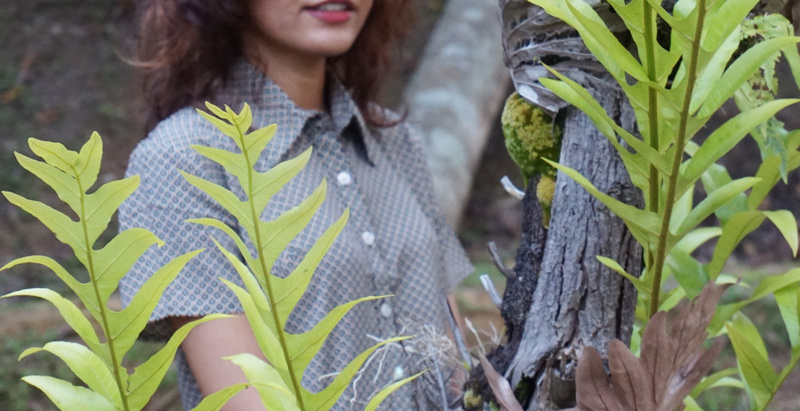 The time I went to see orchids and immersed myself in greenery in my casual OOTD that felt okay but was blah in photos. 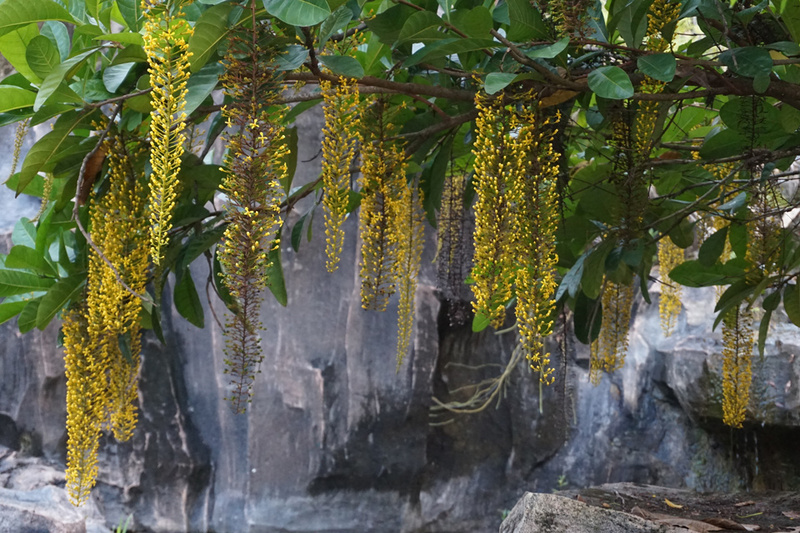 We went to the orchid garden in our small town where the flowers bloomed in groomed and neatly-sectioned piece of land that had a greenhouse, a man-made waterfall and other architectures. As usual, the mosquitoes were the beast and the kind you really want to run away from here in the evening. The breeze was on low, humidity on high and my mom (whose body temps rise even in fairly chill settings) understandably was less that excited over my enthusiastic invitation. I should get a friend! Yes, another human being, that is not a cat! Joke aside, this orchid place has been there for ages but somehow, it has an energy about it that says, don’t bother coming. Which was why, I totally wanted to come. I knew it was going to be perfectly vacant, except for an on-duty guard and perhaps, a cat or two. I wish the mosquitoes weren’t there but I allowed them to feast on my sweet flesh for a while just to sight-see and take photos. Mom took a few of the nature shots along with my OOTD which I did not like in pictures. The collared boxy top had this retro print I liked but somehow, with those jeans, I felt it just didn’t translate. When I wore it before stepping out, I felt okay. Then I realized it could be better paired with a skirt instead but as usual hairy legs had to be taken care of and that, I had no time or patience for that evening. Nevertheless, mom and I enjoyed the beauty of our tropical orchid blossoms and I hope that you’ll enjoy looking through the snaps of that day. 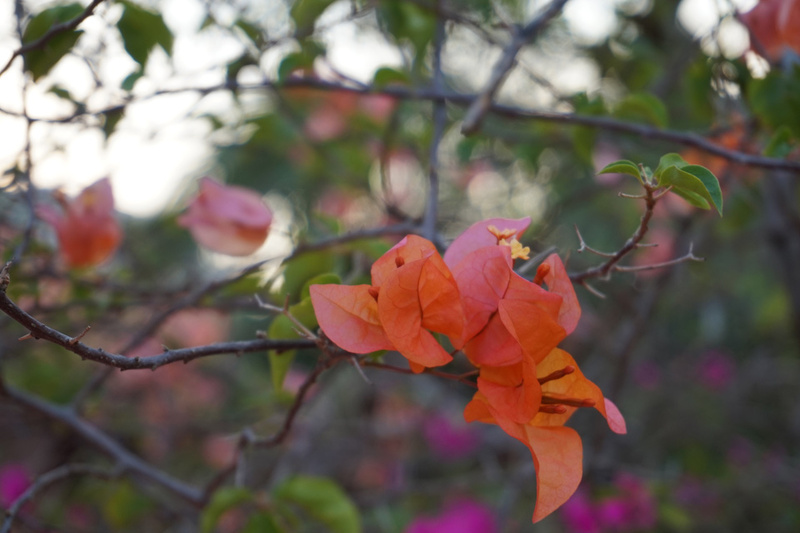 This is not an orchid but I love the ombre shades of this bougainvillea. 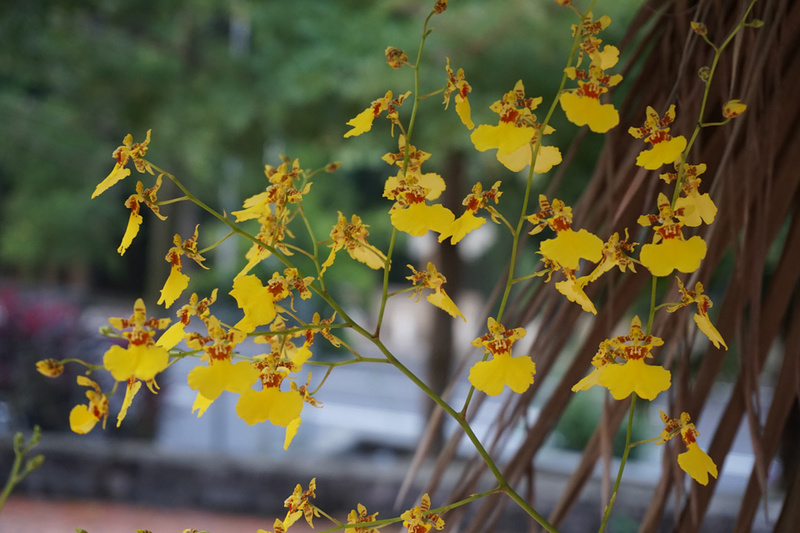 Tiny yellow orchids that conjure up mental pictures of butterflies in flight. 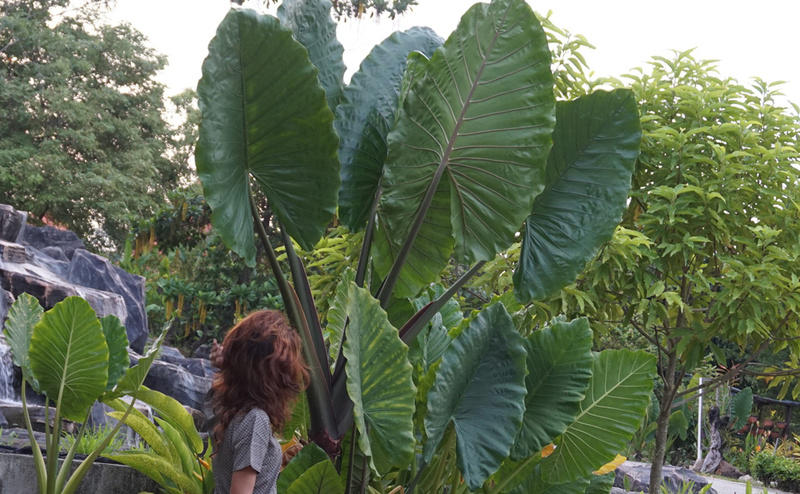 This is me enthralled by the gigantic leaves. They’ve always been my favorite and still, I don’t know what they’re called. 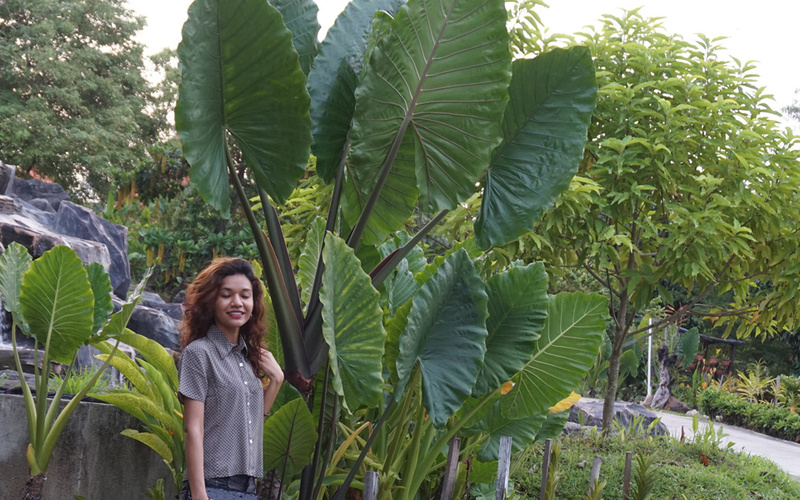 You can definitely use one giant leaf as an umbrella if you’re too cool for the conventional kind. Alternatively, you can use it to hide your pretty face from the glaring tropical sun if you happen to be out in the street and don’t mind being a sight. Yes, perfecto. Why don’t I smile with eyelids closed instead? Mind-blowing. I have a thing for standing around or over drainage systems. What does that say about me? Ready to go with the flow? Tragic pun, I know. The sight of these dangling beauties made me extra happy. Once again, the yellow orchid of the tiny variety. 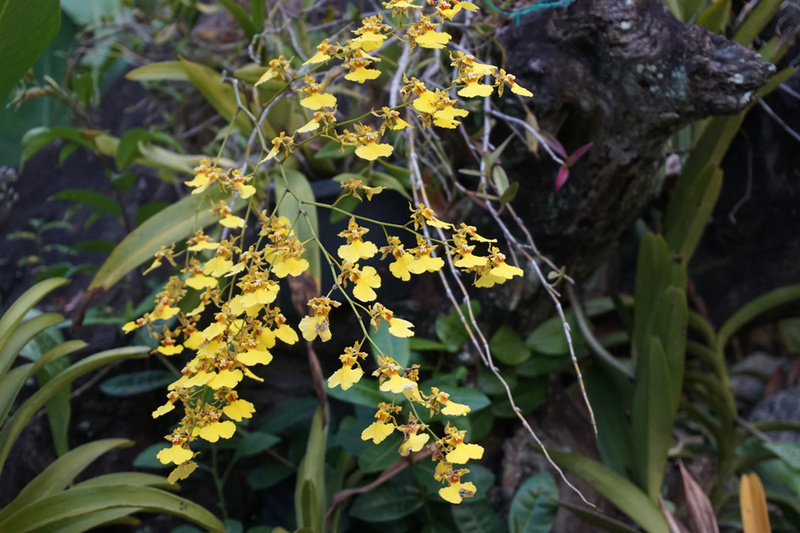 I wish I’m fluent in identifying orchids but this yellow ones (that’s how specific I’m able to get at the moment) are one of my mother’s many favorites. 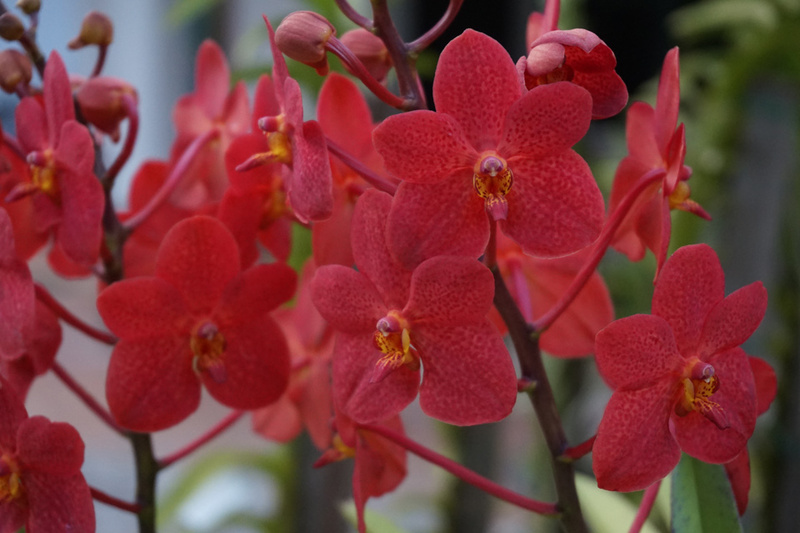 This red orchid is a sight, don’t you think? Let me Google something interesting to add. 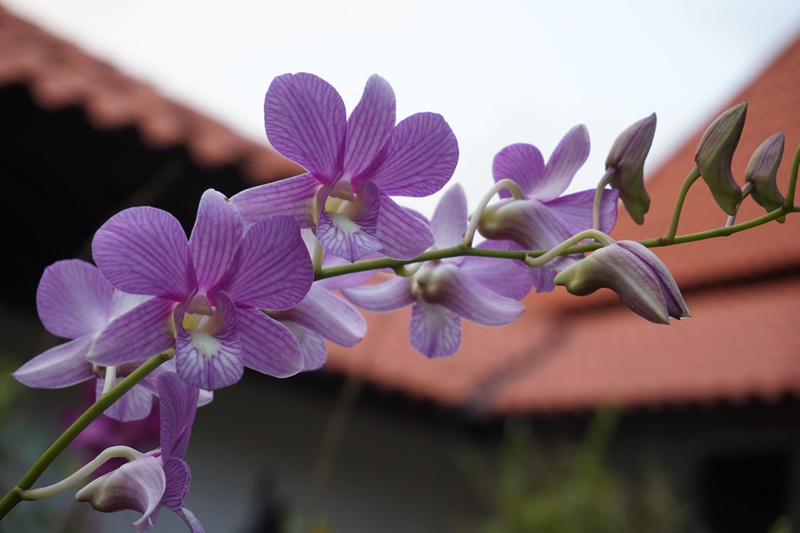 Did you know that orchids are very ancient plants? According to fossil records, orchids have existed on the planet around 100 million years. Cue, mind explosion. BOOM! Did you know that orchids manipulate just like us humans? Since they are pollinated by insects, they take on specific appearances either to attract or repulse the pollinators. Case in point: bee orchids. The picture above isn’t of bee orchids, by the way. Bee orchids resemble a bee chilling on a 3-petal flower and a male bee who is feeling amorous gets tricked into coming in contact with the orchid. Instead of a mate, the bee gets nothing but free frustration and the pollen is transferred. Nature, you smooth, and always on point. So, what have you sweet people been up to of late? Why are some of you missing? I miss those comments that go really long! To those who have been visiting my blog always, thank you so much! You have no idea how much I appreciate each one of you.